It is hard not to read into this re-organisation and re-naming of a government department a sidelining of Arts and Culture in Northern Ireland. Similarly, in Westminster, there isn’t a dedicated ‘Minister for Culture’ but a ‘Minister for Culture, Media & Sport’ and the first stated priority of this minister’s department is “growing the economy.” So, we’re left in little doubt about what the government believes is most important about the arts. I’m not without sin in this regard myself, however, as I have been known to persuade local businesses to support arts events in the town I live in because they will increase footfall (business people, this is true, by the way). Investing in arts and culture can, indeed, “grow the economy” but that is only one small benefit. For the past thirteen years, I’ve lived in an area of low cultural engagement and low educational attainment and, for the past six years, paid and unpaid, I’ve been involved with arranging, delivering and supporting poetry and literature activities here. I’ve read and written poetry with schoolchildren, home-schooled children, people with no formal qualifications, people with doctorates, people who left school as young teenagers, people living with cancer, people living with dementia and memory loss, carers, retired people, waged people, unwaged people, people aged from in their twenties to in their nineties, people whose first language isn’t English and people who fit into none of these categories. The unifying factor of them all has been the positive, life-affirming responses that they’ve shared after being introduced or re-introduced to literature . Always different for each individual, across the board, engaging with literature has caused people to talk, argue, agree, disagree, laugh, remember, create, feel proud, feel listened to, feel admired, communicate for the first time in years, feel happier, feel more in touch with their emotions, say that they are more interested in living, feel motivated to find out and come back for more, feel curious and excited. And that’s probably only half of it. So I’m an enthusiastic supporter of poetry festivals. We need them and I’m grateful for the hours of work (often unpaid) that go into them. Sure, Winchester is an affluent area* but affluent people need poetry too (and not everyone who attends events in an affluent area is affluent, of course). *introducing a poem about finding Ezra Pound’s poems in Poundland, Simon Armitage thought it best to check that the Winchester audience knew what ‘Poundland’ was. (it’s a shop where everything costs £1, in case anyone is wondering). 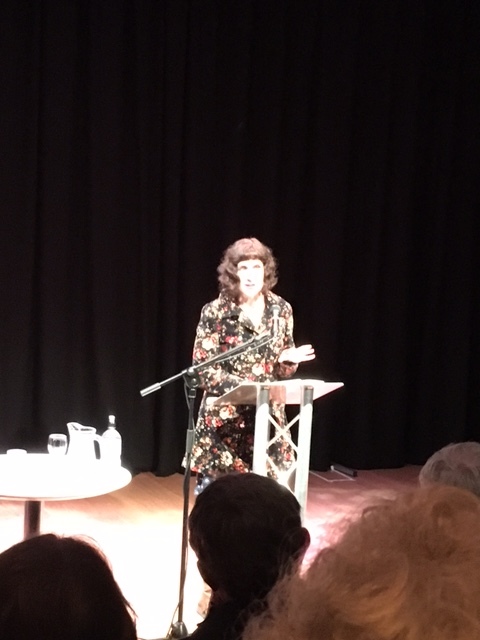 You might also like to read Zoe Mitchell’s account of the festival here and do, please, get in touch if you’ve blogged about the festival, or other poetry festivals, so that I can add your link to this post. The next Winchester Poetry Festival will be in 2018 so make some space in your diaries. Thank you, Josephine, for all your reports, thoughts and insights about Winchester Poetry Festival 2016. Much enjoyed. NB : as I mentioned to Simon Armitage, even Winchester has a Poundland.